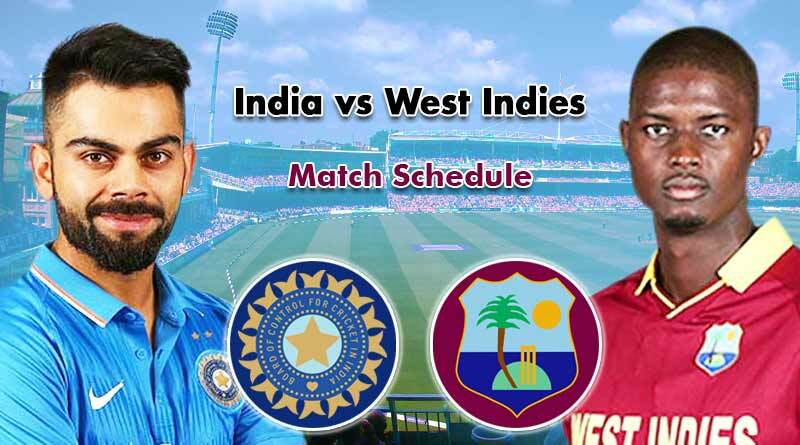 India vs West Indies match schedule – The BCCI on Tuesday announced the Indian cricket team’s schedule for the upcoming series against West Indies at home. The series which will follow the Asia Cup will see India play a two month long series against the Caribbeans. These include 2 tests, 5 ODIS, and 3 T20s. India’s hectic season is all set to continue with West Indies touring the country to play 10 matches across all the three formats of the game. The India vs West Indies match schedule was released after both the West Indies Cricket Board and the Board of Control for Cricket in India penciled down the tenure of the series. Kicking off just a week after the Asia Cup concludes, the two sides will play the first of the two test matches on October 4 in Rajkot. The test series will be followed by the ODI series which begin from October 21 and go until November 1. The 3 T20s follow suit and will be played on 4,6 and 8 November. The Indian team is currently playing England in a five-match test series with the last match scheduled for 7 September. The team will take part in the Asia Cup following that from 15-28 September which will see them compete with Bangladesh, Pakistan, and Sri Lanka. The series will see Lucknow host its first ever international cricket match when the two sides take on each other in the second T20 on November 6. The teams for the series are yet to be announced by the BCCI. Be with us for all the latest team news and on-field action relating to this series. For more updates like India vs West Indies match schedule, like and subscribe to tentaran.com.